July is Parks and Recreation Month in the United States and this is a great time to help the seniors in your life be able to enjoy time in the great outdoors. 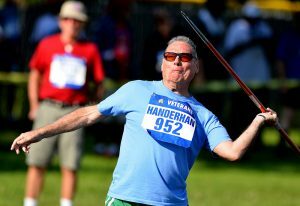 In Detroit, Michigan this week, there are a hundreds of senior soldiers that are taking part in the National Veterans Golden Age Games, offering sports and recreational competitive events for Veterans 55 years of age and older. Although some of our seniors may not be able to always enjoy everything that time in the outdoors has to offer, the caregivers at FirstLight Home Care are pleased to be able to offer ideas on how to maximize the benefits of exercise during this month. The National Institute on Aging offers a wide variety of programs and resources designed to help seniors get more exercise. As home care providers, we are familiar with the unique challenges that seniors can face in getting the right amount of exercise and offer the following tips for taking advantage of the benefits of Parks and Recreation Month. Walk in a Park: No matter what type of pace you can manage, being able to walk in a park is a great way for seniors to enjoy time outdoors. Speed is not as important as being able to walk in a park, which can lead to even longer walks as time goes on. Make sure that the seniors in your life have comfortable shoes, wear light clothing and stay hydrated during their outdoor walks to keep themselves comfortable. Bike or Boat: If your local community has bike trails or a boating area, enjoy time in the great outdoors during July by taking a leisurely bike ride or hit the water in a boat with the seniors in your life. If you are going for a bike ride, make sure that you ride at a pace that is comfortable for everyone, wear protective gear like a helmet and take breaks as needed. If you have a senior that doesn’t feel comfortable riding a bike, a boat ride while wearing a life vest can be a relaxing way to enjoy time outdoors! Relax in a Park: If the seniors in your life aren’t able to be as mobile as they would like, you can still take advantage of Parks and Recreation Month by taking a drive to a local park and enjoying time with others. Having social interactions with caregivers or family members can help seniors feel a part of a social group, so make a day of it! Take a light lunch, spread a blanket out and enjoy time together in the natural beauty of a local park. No matter the level of activity that the seniors in your life are comfortable with, you can still enjoy time together and the beauty of the great outdoors during Parks and Recreation month. If you have a question about helping the seniors in your life get ready for a day in the park during July, or other topics related to caregiving, contact our “Just Ask FirstLight” service today for more information!